Often one of the most important steps in assisting an injured diver with decompression sickness is to administer oxygen. 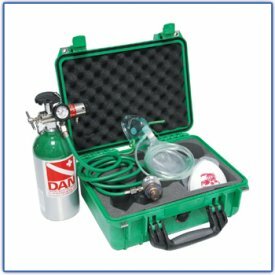 Although oxygen is often accessible, most people do not know how to administer oxygen to the injured diver. This course will teach you to recognize possible dive-related symptoms and to administer oxygen first aid. When appropriate, while activating the local emergency medical services (EMS) and/or arranges for evacuation to the nearest recompression chamber. In addition we will teach you the procedures for treating a pressure related dive accident or near drowning victim. General diving anatomy, physiology and physics. You can view our Open Water course calendar under Education, Calendar. You can view our Continuing Education course calendar under Education, Continuing Education, Con Ed Schedule. Refreshers are set up on a per student basis and can be scheduled for most weekends.